This is the third year that The Stampman are holding their Annual Awards. They have asked for us to show our best or favourite piece of work we have created over the past year. Not an easy task, choosing, for looking back, it has been a prolific year for me, for I am now on three Design teams. However, the item I have chosen is my favourite for personal reasons. I altered this cheap IKEA mirror for a friend for a gift, which was in September this year. I first painted the mirror with blackboard paint. I stamped the Poppies and the lettering with Elusive Images stamps, the butterfly is from Lyndsay Mason stamps. I used several shades of TH Distress Inks to watercolour paint the images. The images are glued on rather than stamped directly onto the board. Your Choice - Not Christmas! ﻿Today I found an interesting challenge blog, called the Rainbow Lady's Challenge Blog. Thanks to the wonderful service provided by the Feline Playful blog, their logo is in my side bar. At the Rainbow Lady's blog, it seems this week we are able to make our own Choice. As much as I love Christmas, it will be a few weeks before I want to even think of making a Christmas card. I aim each year to make at least one a week, during the normal non Christmas card making time. I hope this non seasonal card will fit in for the challenge. 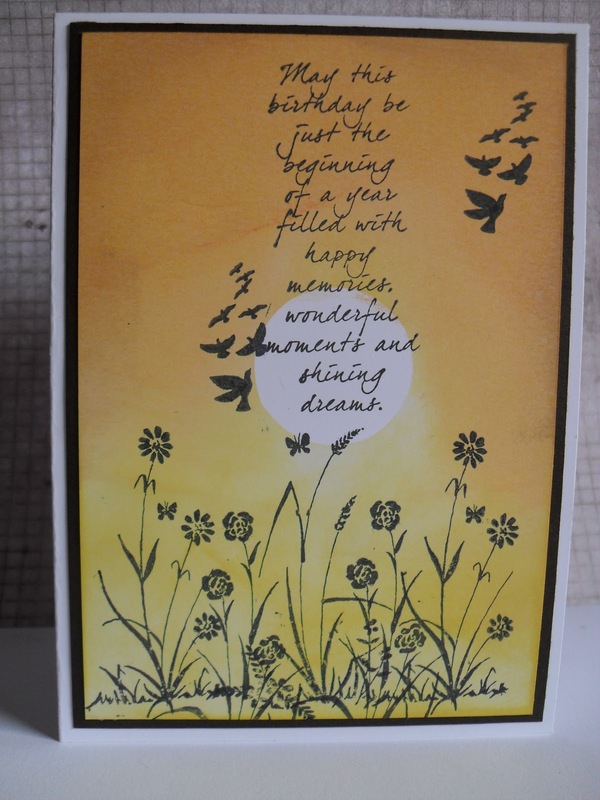 TH Distress Inks, Mustard Seed, Dried Marigold and Wild Honey. Grasses - Birds - Inkylicious. I hope you all had a wonderful Christmas Day and have either a nice relaxing, or hectic but fun day planned for today Boxing Day. My cold is slowly improving, but I greatly enjoyed today. I will add some pics over the next few days. It was my birthday today on the 25th, so for a change we decided to have a big buffet and guess what I had my very FIRST Birthday Cake, everyone thought it was time I had a birthday, but we still all swapped our Christmas presents. Tomorrow -Boxing Day we will be joined by my younger son and his family when we will be tucking in to a traditional Christmas Day lunch. I have been so confused ovet the past few days, but all is now prepared for the lunch tomorrow, so I'm off to bed. Many thanks to all of my friends for the beautiful birthday cards, it's so special having such wonderful crafty friends. Hi friends in blogland. I'm sorry I'm not being very active at present, I have a rotten cold and am feeling as you can imagine. I WILL be okay tomorrow evening and on Sunday and Monday when the family are visiting. MERRY CHRISTMAS to all of my Followers. many thanks for your support over the last year. will be popping back soon over the next day or so. At this time of year, everyone is so busy, if you do have the luxury of being able to slip away and spend some creative time we at Try It On Tuesdays are giving you the opportunity to please yourself. We are asking for Anything Goes. Whatever you feel like making, last minute gifts or something for yourself. Why not pop over, for the design team have had a ball playing. Talking of balls, well baubles actually, these are three baubles I decorated from polystyrene foam balls which are relatively cheap. They are easy to make, but it does take patience and time, though you can probably sit during your favourite TV programme and make a few. I was shown how to make these a few years ago, by a wonderful lady. I think there may be instrucitions on You Tube, if not, and if I received any requests, I will for next year add the instructions to my Tutorial Blog. Our challenge for the next two weeks is for a Seasonal Tag at Make My Monday. It will be our last challenge for 2011, for we are having a week's break over Christmas. The DT have made a fabulous collection of tags, please pop over to see them all. We have an exciting programme ahead for 2012, we are so looking forward to the future challenges. It would be nice if you made a New Year resolution to tune in to us each week to check out our challenges. 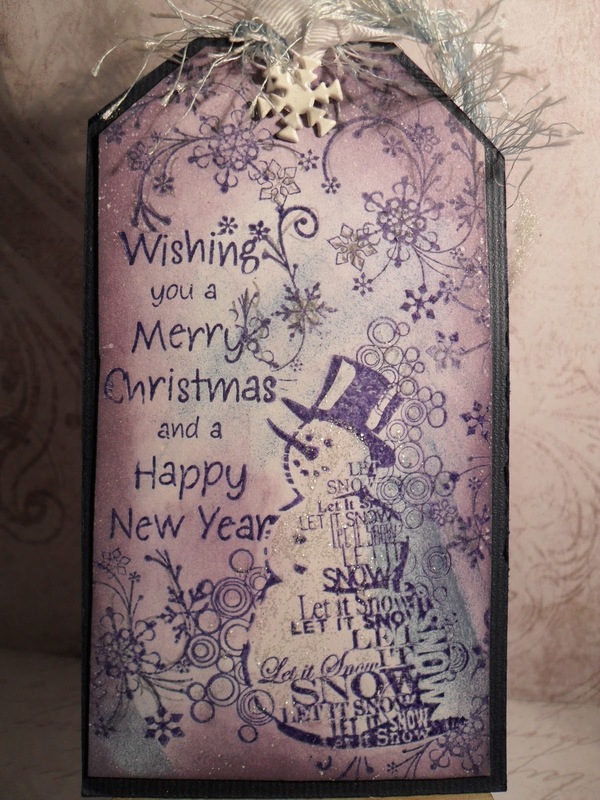 For my Seasonal Tag I stayed in my comfort zone, stamping. I used a piece of plain white card, Mediterranean Blue Brilliance ink pad, a favourite Santa of mine, a snowflake stamp, a Happy Christmas greeting and of course some glitter. Matted onto a silver holographic card. I'm not sure whether it shows on the pic, I added some Glossy Accents to his glasses. Have fun, I look forward to visiting you over the next few weeks. I would like at this time to wish each and everyone of you who have supported us at Make My Monday since we started, and to those who have joined us along the way, a very Happy Christmas or if more appropriate Happy Holidays. For the next two weeks at Fashionable Stamping Challenges. - Christmas time makes us think of all our loved ones who can’t be with us, so we have decided to travel the world and keep them in our thoughts. It could be with a postcard, or you could visit a country, take a suitcase, send a letter, go by car, boat, train, plane, the list is endless, but more than anything have fun with your project and think of all those families who, for whatever reason, will not be able to spend time together this Christmas. I decided to hop on a plane and go to visit a carnival in Rio de Jenaro. I enjoyed spending the time in 'blinging' up this crd with glitter, jewels and Sakura glitter pens. The stamp of the dancer is an old one from Rubbadubbadoo, isn't she wonderful in all of her feathers and finery? Please pop over to the blog for the remainder of the design team have excelled themselves with some fabulous travel projects and again our leader Shirley and the wonderful Andrew have provided us with an exciting platform to present them. I look forward to checking in on your travel project. With great saddness I was told of the sudden passing of a crafting friend. Mandy 59 - Mandy Honer, in Yorkshire. 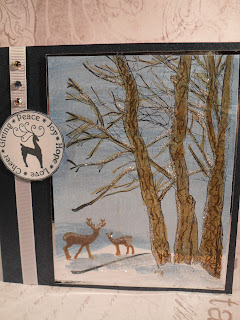 I 'met' Mandy through the Do Crafts ATC Forum, many years ago, she was one of the first persons I swapped ATCs with. Over the past 5 years we had met at least four times, chatted on line and became good friends. Mandy was a warm, frinedly, loving and a wonderfully creative person. I will treasure the box she gave to me, which I wanted to share with you. 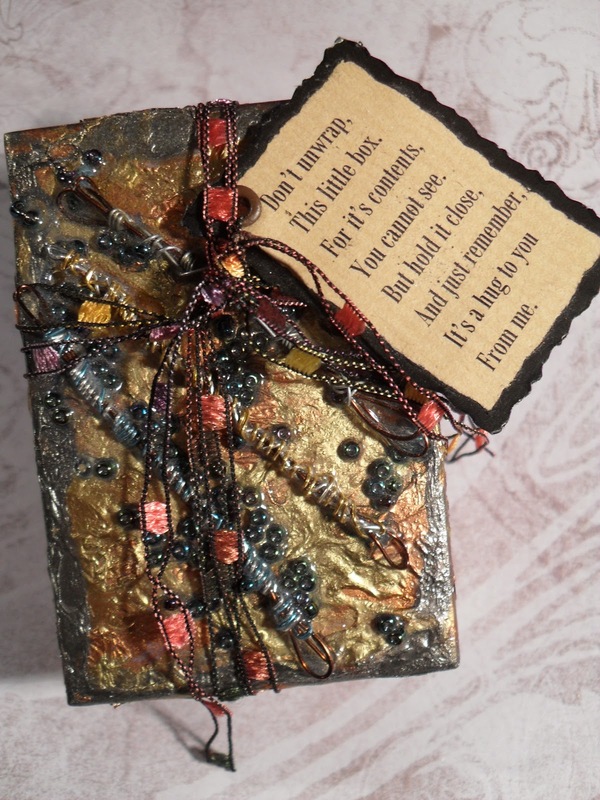 It is covered in gold flakes, beads and a few jewels with an adorable little verse, which was sent to me at a time when she knew I was in need of a hug. I pass on my sympathies to her family and her many grandchildren, each of whom she was so thrilled and proud. I will miss Mandy but feel I have part of her love with me in the little box. RIP my friend. ﻿This week is Tags week at Try it on Tuesdays , and of course being the time of the year it is we would like to see Gift Tags Galore. 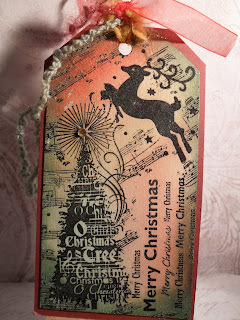 On my first one I stayed with the traditional green and reds and used a tree and reindeer stamp. 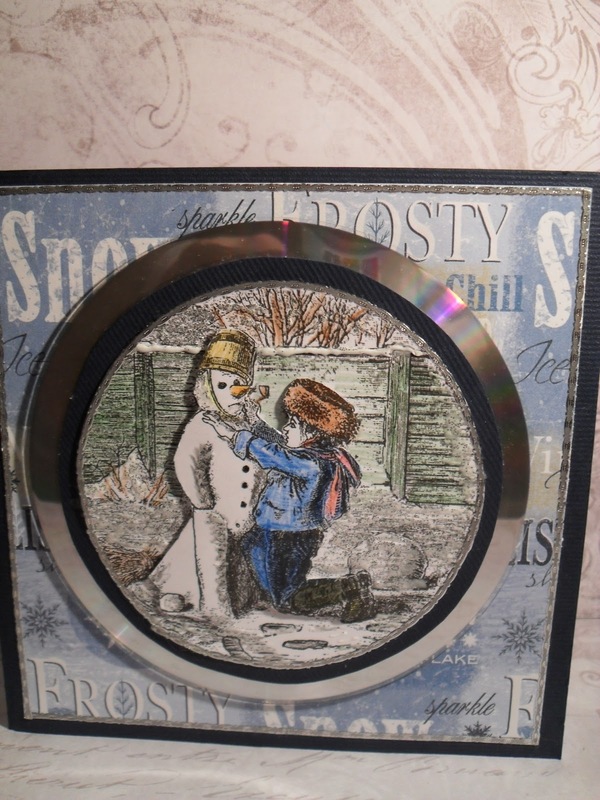 On my second tag which I am also entering into Let It Snow at St. Luke's Charity Card Challenge I used the snowman and snowflakes stamps. All the stamps are by Inkadinkado from various sets. All the inks are Ranger's Distress Inks. I do hope you will pop to both blogs and take a peek and even enter into the fun. I know we are all so busy, I'm late, but better near the end than missing it. have fun. It's quite late for me to be entering my card into the St. Luke's Charity Card Challenge, but then it's a busy month for everyone isn't it? 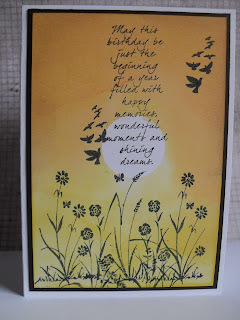 This stamp is from Kanban, I first created the background with a watercolour wash, using DI Broken China. I coloured the trees with watercolour pencils and stamped the deer with Vintage Photo. The circular sentiment is of course a free stamp from Craft Stamper magazine. ﻿During December at Make My Monday, our theme is for a SEASONAL PROJECT, our requirement for this week is for you to add a RED RIBBON. 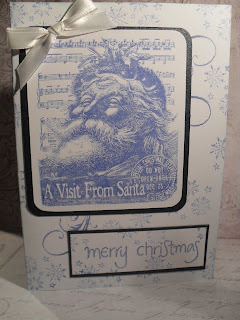 My fellow DT members have made some awesome cards, so please be sure to pop over to the blog. 3 of my older grandchildren this year have asked Santa for money, so they can have the fun in spending it. A reasonable request, but not as exciting as to watch them open a parcel or two. 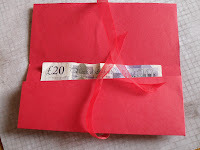 I made wallets so I can pop in their cash, at lest they will have something festive to open. 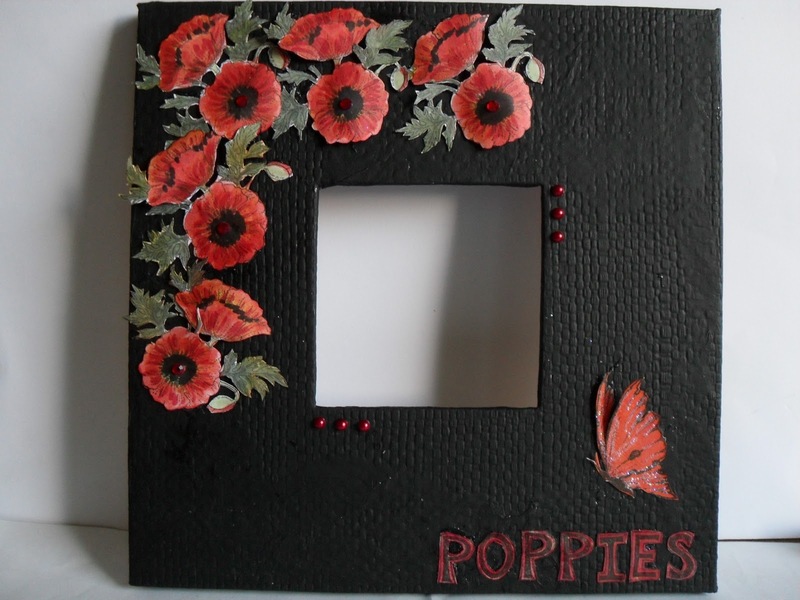 The template is so easy, cut a piece of red card to measure 19cm wide x 23cm in length. Score full width at 8 cm, repeat at 16 cm. Fold up the lower section. On this 3rd section, from the lower left corner place a ruler at an angle up to approx 1cm from the first fold, draw a line , then cut it out. With double sided tape or a little glue adhere at the edge, the highest section only to the middle section. I then adhered the ribbon at the centre of the folded over front secdtion. Cut a dark green mat adhered to the front of the wallet, which hides the adhered ribbon. 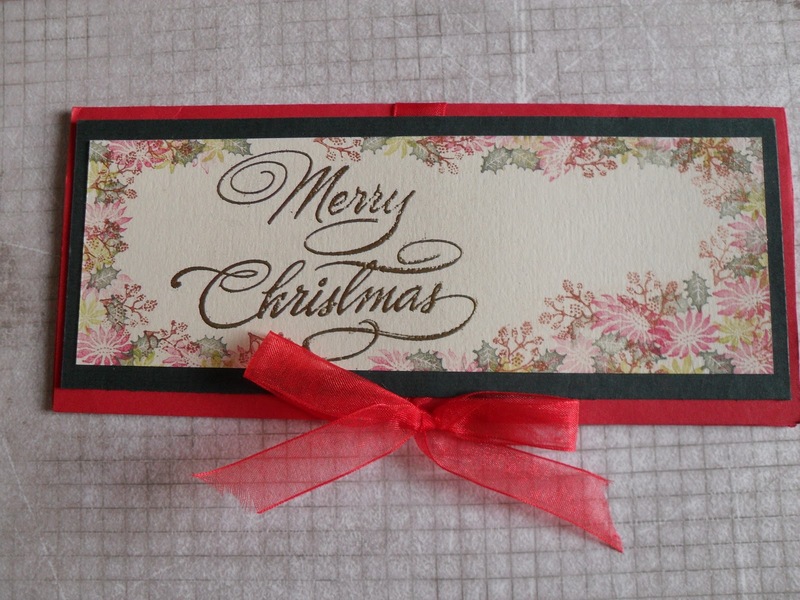 Cut a piece of cream card, stamped Merry Christmas, embossed with gold E.P. 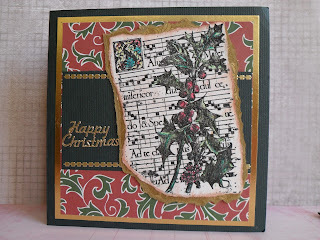 I then stamped with various red, green and gold inks using my Poinsettia set of tapestry peg stamps. Adhere to the dark green mat. Thanks for visiting my blog, I appreciate the time it takes. These wallets are so easy to make and of course with different colours and stamping they can be used for any money giving occasion. This week at Try it on Tuesdays it is card week, so you could win a £10.00 voucher from One Stop Card Crafts, please see their logo in my side bar. We know The Big Guy, throughout the world by so many names, I personally love the sound of Kris Kringle, from one of my all time favourite movies, Miracle on 42nd Street. We know him as either Father Christmas or as Santa Claus. We are giving the centre stage to him this week. Everyone must have at least one stamp, there are those of us who are greedy and have more, I took a while to decide which one to use. 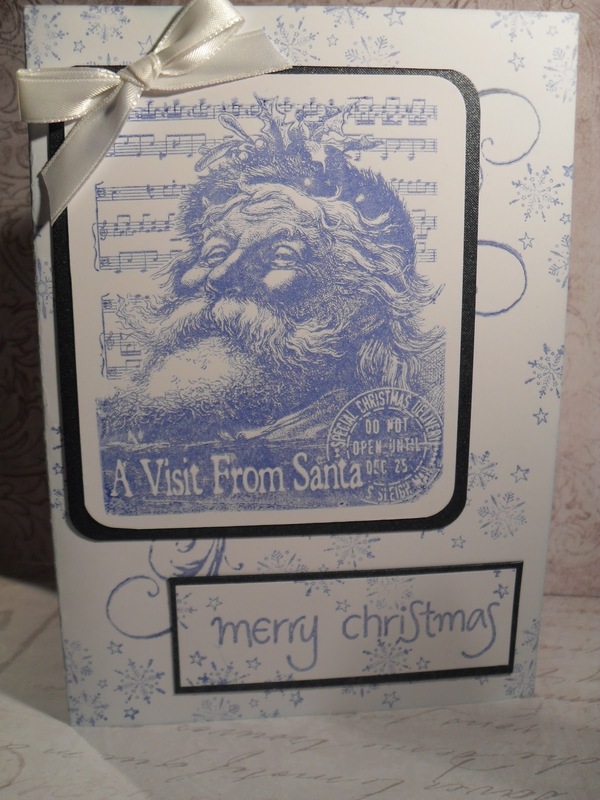 I decided on A Visit from Santa by Paperartsy. 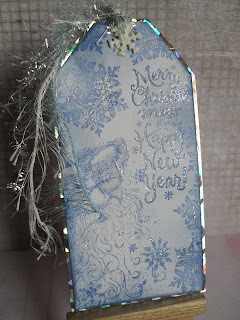 I used a Brilliance ink pad, Meditteranean Blue for all the stamping, the snowflakes and the greeting. I hope you like him in monochrome. I look forward to visiting your blogs to say hello to you and your Santas. ﻿Here we are the first week in December, how the times flies. This is the first week of our esteemed group leader, Jacqueline's choice of Anything Goes as long as it is Seasonal, Chritmas, New year, weather, anything you like. The first week, we are asking to see GLITTER. Mine is yes, another Christmas card. I made a scenic card, which all started with tearing apiece of copy paper for the skyline and snow. I coloured the sky with Distress inks, Faded Jeans and Broken China, with a light touch of Chipped Sapphire around the edges. The small trees were later stamped across the horizon. 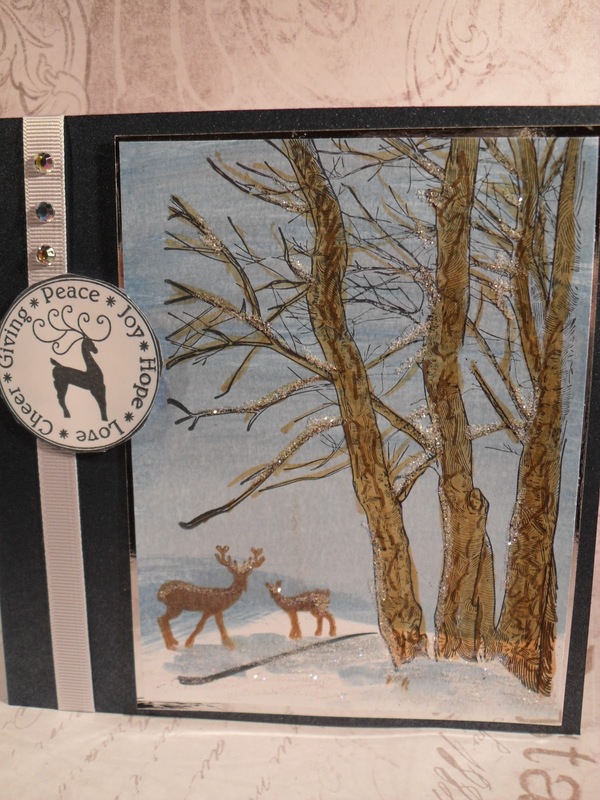 I made the dear off the card, painted and glittered him, then glued him to the card. The spruce branches are stamped onto the card using Memento Cottage Ivy ink. 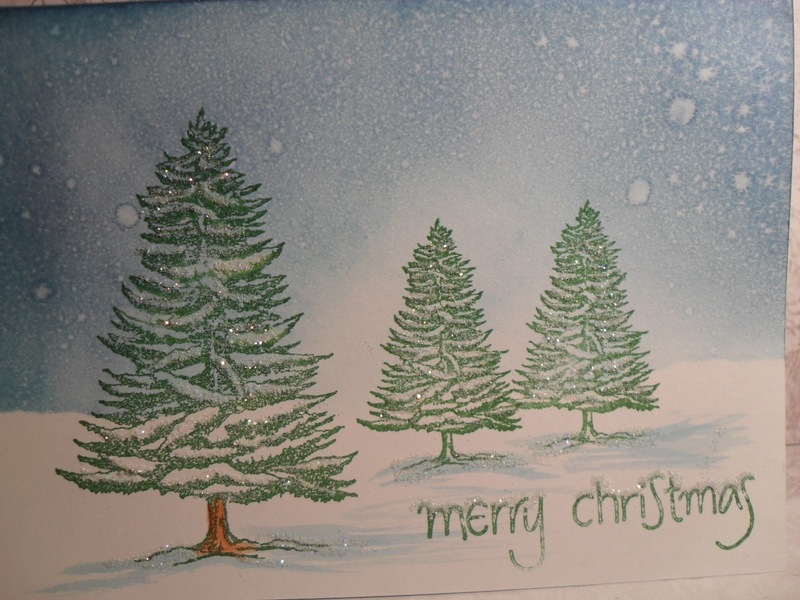 Using a glue pen and Jones Tones, my absolute favourite snow glitter, sprinkled here and there. I hope you enjoy my card, thanks for your visit. Horizon trees from Elusive Images Trees set. ﻿For the next two weeks at Fashionable Stamping Challenges we would like to see your creations which fit the theme of Dressmaking, Corsets and or Acessories. I'm really looking forward to visiting you all, I was unable to visit last week and leave comments due to computer problems, but I so don't want to miss your entries over the next two weeks. I actually don't have any dressmaking stamps, apart from one sad lonely sewing machine, so I concentrated on the corset theme. the front of the card I used a TH pink sheet from the Shabby stash , coloured it more with Worn Lipstick and Fired Brick Distress inks. I stamped the lady twice, once on plain card so I could colour her face, hair and the background of the chair. 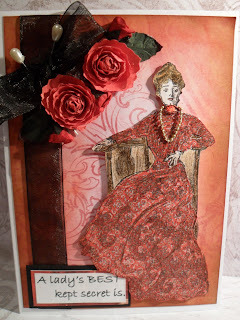 the 2nd stamping was onto a piece of small print pretty red paper to give her an interesting dress, which was then decoupaged onto the first stamped image. I added a small piece of gold chain for a necklace. I made the two larger red flowers with the spiral technique. The computer image of A lady's BEST kept secret is.... meant to entice you to open the card... inside which are several variations of her corsetry. -her Underwear. The Corset is from Bavura stamps from E - Bay. Thanks for looking at my blog and this card, I hope it inspires you, in any small way. Firstly congratulations and welcome to Mynette and Val who have joined the Deezine Team, they will be with us starting neaxt week. All entries were fabulous, again a dificult decision. I am sure they will both show how their different styles will blend in with the team. best wishes to them both. ﻿This week finds us at our last week of the November projects. Thanks Suzi for the lovely selection we have had. 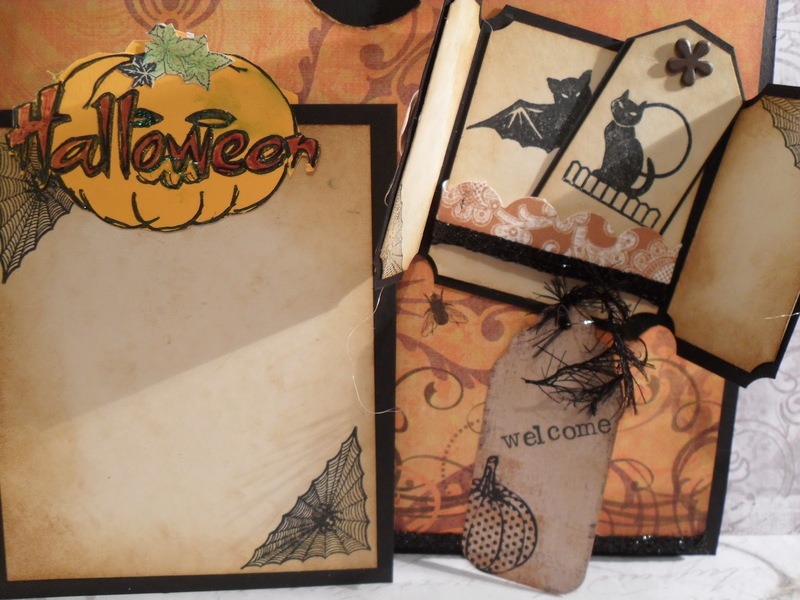 We normally ask you to produce any project, whether it be a card, scrapbook page, an altered project anything you want to make in line with the required theme. This week we are being different, and why not? Suzi thought of a Christmas box, now this can be one you make, an altered one or one you have decorated. I chose to make one of the really easy small Pizza style boxes. There are quite a few instructions and demos on You Tube, if your interested. It only used one piece of card measuring 6" x 11", a piece of glittery ribbon around the edges, I stamped a poinsettia flower for the lid, but decided I wanted more height. The fancy ribbon is one of those with an inner piece of thread and you pull and pull till it all twists itself up. I'm sure you know what I mean. I look forward to visiting your blogs. It was so heart warming to see so many gorgeous Christmas cards, it certainly won't be an easy task to choose the Top 3. 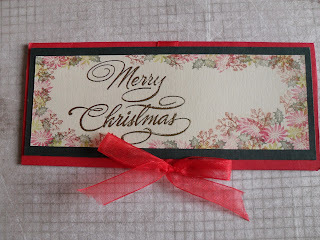 Stamp -Poinsettia from Chloes Creative Cards. We at Make My Monday are continuing our theme of Christmas for the month of November, for this week we would like to see your creations showing either FLOWERS, FOILAGE or SNOWFLAKES. Such a wide choice available. 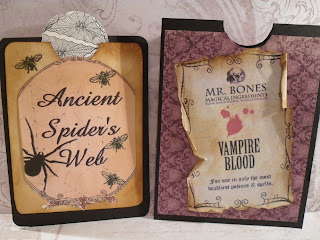 Please pop over to the blog to check out the Design Teams creations which are fabulous, so many styles showing the required theme. i will again look forward to visiting your blogs. For my card, I stamped my favourite swirl stamp, heat embossed with Silver Bells Wow! E.P. added some pearls and crystals. 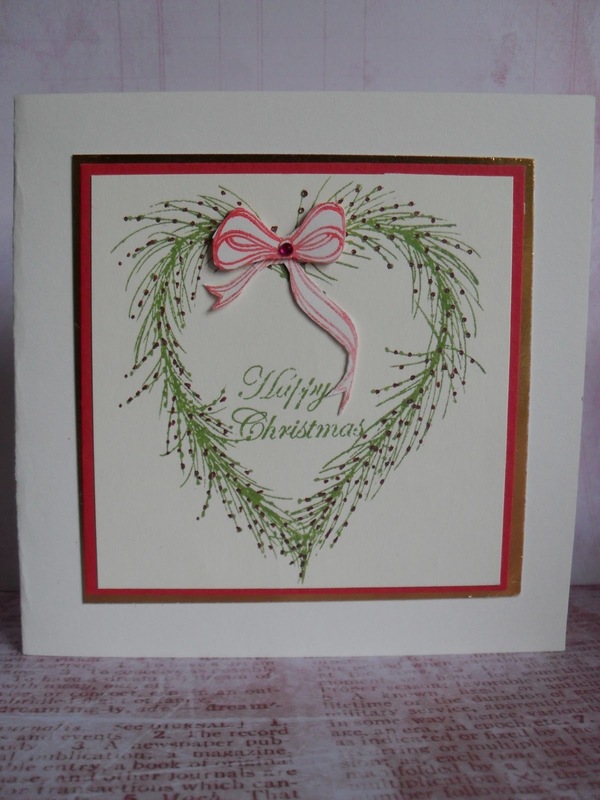 I stamped the main image, the foilage heart wreath and ribbon as I had the dge of the card. 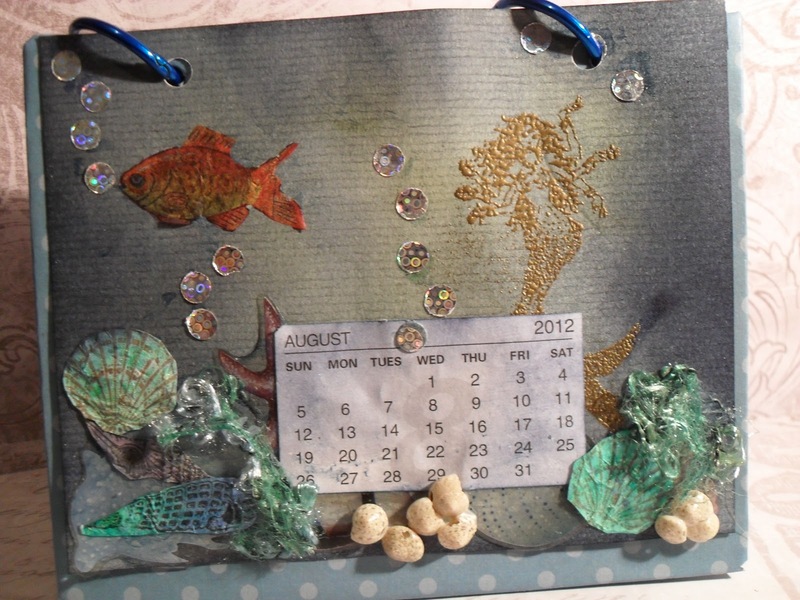 Again added pearls and crystals to decorate, Matted onto a piece of silver mirri card. 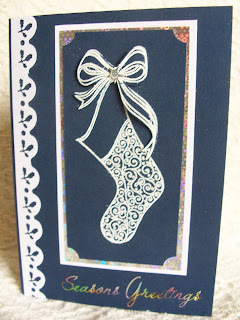 Foilage heart from Chloe's Creative Cards Swirl Stamp - La Blanche - Bow stamp -Debbie Moore from the top of Christms Stockings. ﻿For a complete contrast, I also made this card, the layered poinsettia, being the focal point. 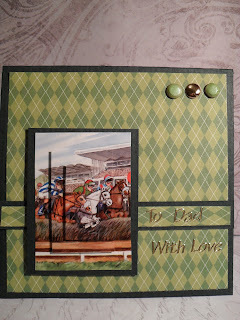 I stamped onto both green and red card, using gold EP. Cut, layered the levels. In the centre of the poinsettia I glued small gold beads. Stamp designed by Dawn Bibby by Personal Impressions. I'm Dreaming of a White Christmas @ F.S.C. ﻿I am not dreaming of a white Christmas, not after last year, it started snowing late November and didn't stop till mid February. 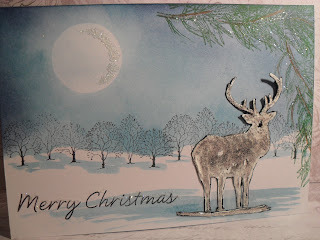 No, not me, it's Shirley and the Design Team over at Fashionable Stamping Challenges They have produced some wonderful Christmas cards which will hopefully inspire you to join us this week with your wonderful creations. There is always a super prize for the the winner. Please pop over and have a look at our catwalk to see the treasures. 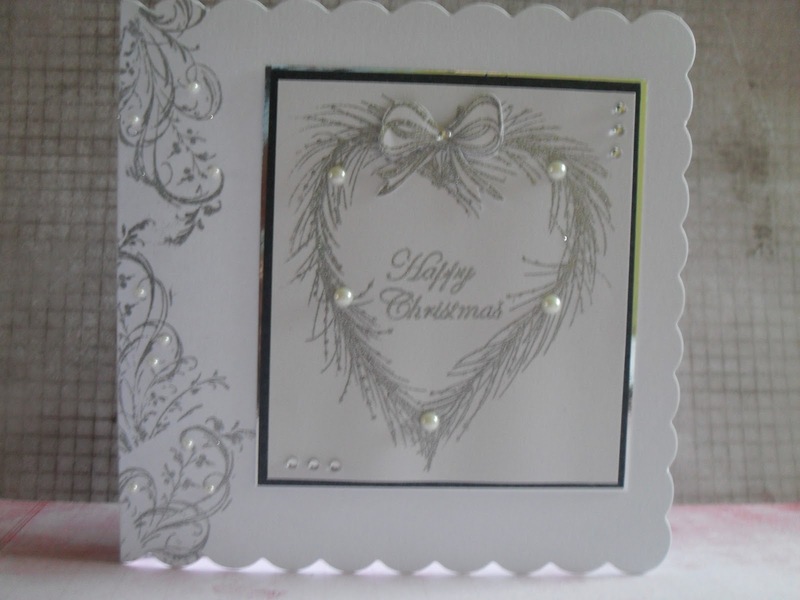 For my card, I decided to take the challenge literally by the title, concentrating on white and silver, sadly the photo doesn't show the bling of the Silver Bells WOW! powder or the silver mirri card. On a piece of cut white card, I stamped and embossed with the Wow! 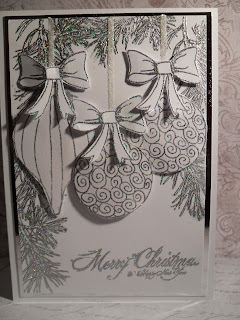 EP, the spruce branches around the outside of the card, to appear as though on a Christmas tree. 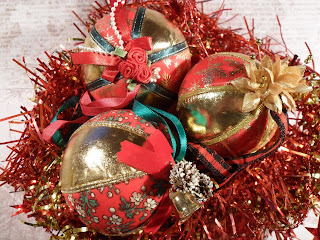 I stamped the baubles and bows, embossed with the Wow! E.P. They were adhered to the card with 3 d foam to give shape and dimension. I again look forward to visiting your blogs, to see your Christmas delights. I made several cards for samples for the Friday craft class today. The theme of the class was to create a snow scene. This was achieved by first tearing a piece of copy paper and securing this to form the horizon of where snow meets sky. To then create the sky using TH Distress inks, we used a selection of inks including, Tumbled Glass, Broken China and Chipped Sapphire. To either spray or not to spray some water onto the blue sky to form snow. I then showed the group the samples and which stamps could be used to make more Christmas cards. 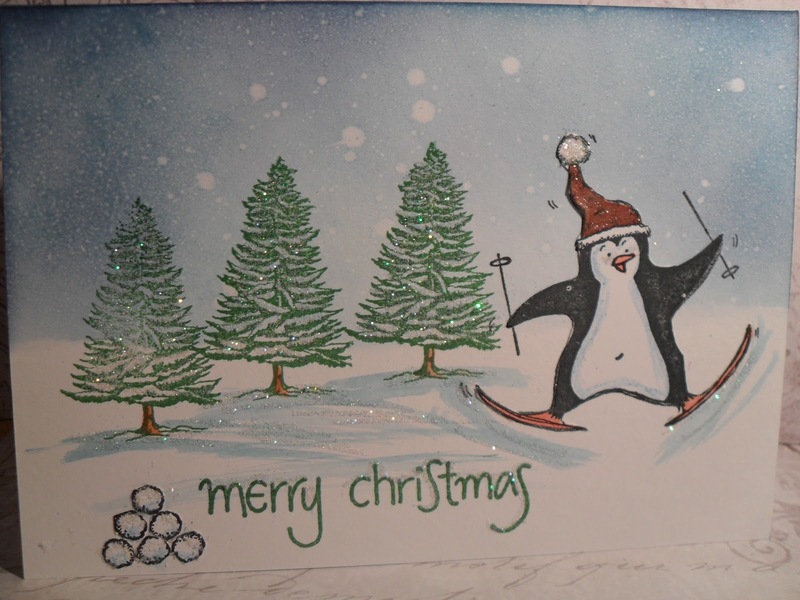 I stamped the penquin onto the card, then added a decoupaged coloured in penquin to be able to get the colouring right. I have 6 samples to show you, so will add the remaing 3 tomorrow. This type of card really doesn't take very long, so I am going to send these first 3 off to the St. Luke's Charity Card Challenge for their Christmas Fayre which is on November 27th, I am sure they would be delighted to receive whatever cards you could spare, every penny helps them in this worthwhile cause. Stamps used above- Fun Stamps Lyndsay Mason Skiing Penquin - Trees from Creative Expressions -Sheena Douglass, Merry Christmas from stash. 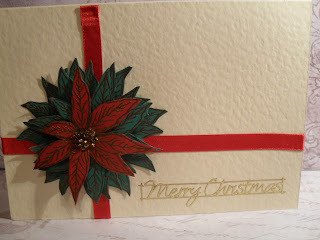 I will enter this card as my 4th entry to their monthly challenge for Christmas cards. Stamps used are as above designed by Sheena Douglass. ﻿Stamp used is the Santa's Sleigh from La Blanche. 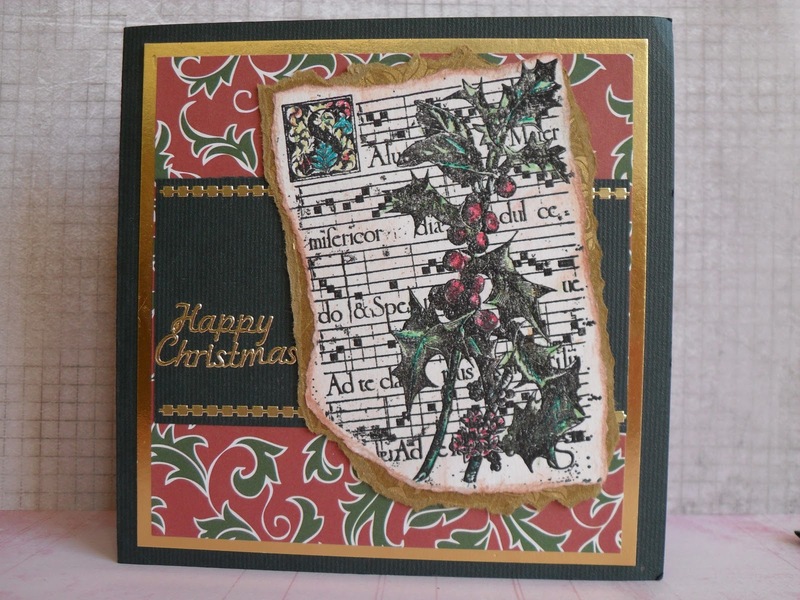 This is my 3rd card, for the Christmas month at St. Luke's Charity Card Challenge. 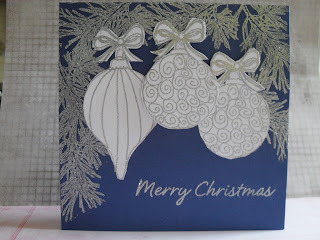 I used a pearlised dark blue card, stamped the pine needles with Perfect Medium (or Versamark), used Silver Bells WOW! Embossing powder, what a fabulous holographic shine it gives. The stamp is from Creative Expressions designed by Sheena Douglass. I then stamped and embossed in the same way some bauble stamps which are from a new designer, who has some fabulous stamps at Chloe's Creative Cards. The sentiment is a Crafter's Companion one I think. I have a small parcel of Christmas cards ready to post to you ladies, probably Friday this week for your Christmas Fayre which to remind folk is on November 27th, I am sure they would appreciate any donations for their big fund raising event. ﻿How was it made? Two inner rolls from 1 x cling film and 1 x tin foil, the ends painted gold. 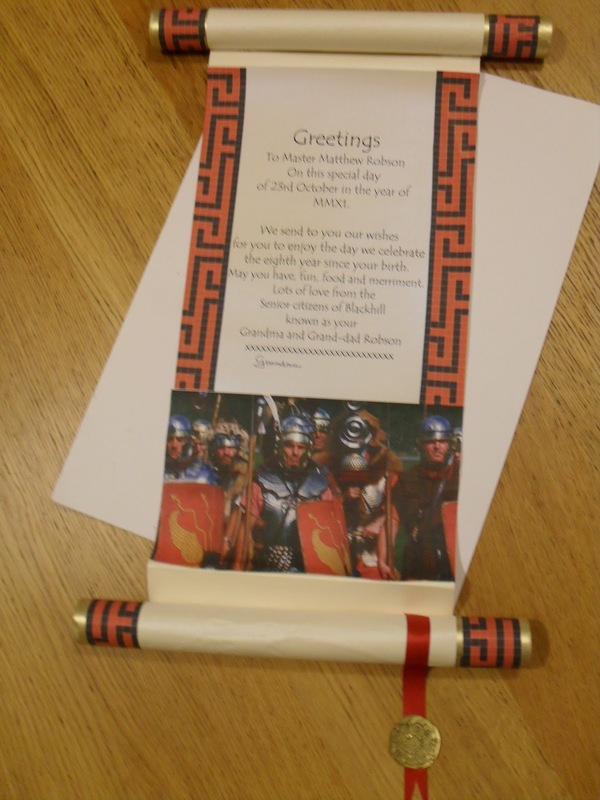 The red and black mosaic patterns were free downloads from the internet as was the photo of the Roman soldiers. Two sheets of pearlised cream paper, so there was sufficient for the rolling at both ends. A piece of red ribbon and a seal to add to the end, made with Metal Magic from Debbie Moore or use any UTEE and add some gold E.P. I had so much fun making this it was something so different. 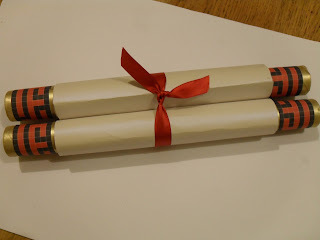 Over on Make My Monday we are starting our new month's challenge - Christmas - for the next four weeks Suzi B has chosen the challenges, it makes Christmas seem ever so close, but then it is, isn't it? For the first week the challenge it to keep it Clean and Simple with the emphais being on The Sentiment. 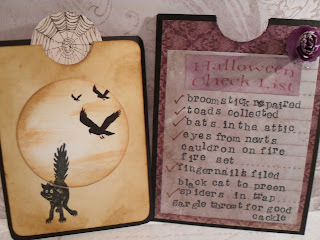 This challenge gave me a great opportunity to use a new stamp, designed by Chloes Creative Cards. I recently bought some Christmas stamps from Chloe at an event in the North East of England, Chloe herself is from Durham, she has designed the above heart stamp, there are some wonderful stamps available, including her new designs, on her blog. 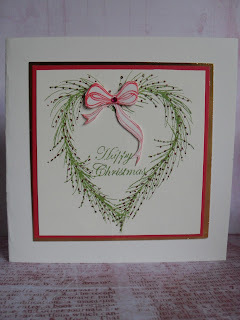 I stamped the heart above with Memento Cottage Ivy and added red dots with a Sakura gelly roll pen. Matted and layered onto red and green card. The bow is from the Christmas stockings stamps from Debbie Moore. I look forward to visiting your blogs, to see your wonderful entries. Have fun, remember there IS a limit on how many challenges you can enter. Please read the rules. Also don't forget their is still a DT call, if your interested. ...............some folk may not have noticed I have been off line for a few days. Changed my internet provider. Why is it, one problem leads to a dominoe roll? Or is that just the way things go for me? I am contacting as many forums and DT challenge blogs as I can, I will add my new e mail address on my blog, which is active from today. 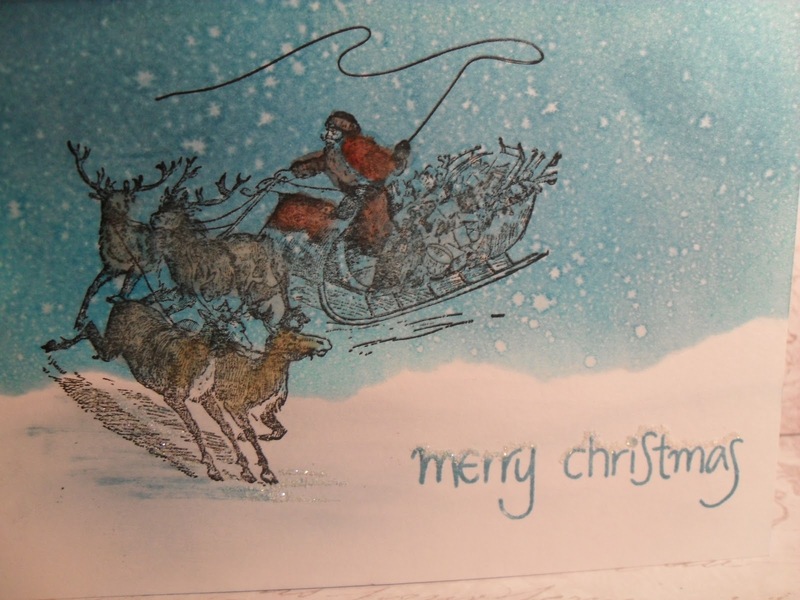 It is now catch up time, I haven't been idle the last few days, I have made a few DT cards and a number of Christmas cards so I'm up to date and on track with them. Bye for now. "It's Amazing What You Can Do with Peel-Offs!! You can't say we at Try It On Tuesdays aren't willing to try all aspects and techniques in paper crafting. 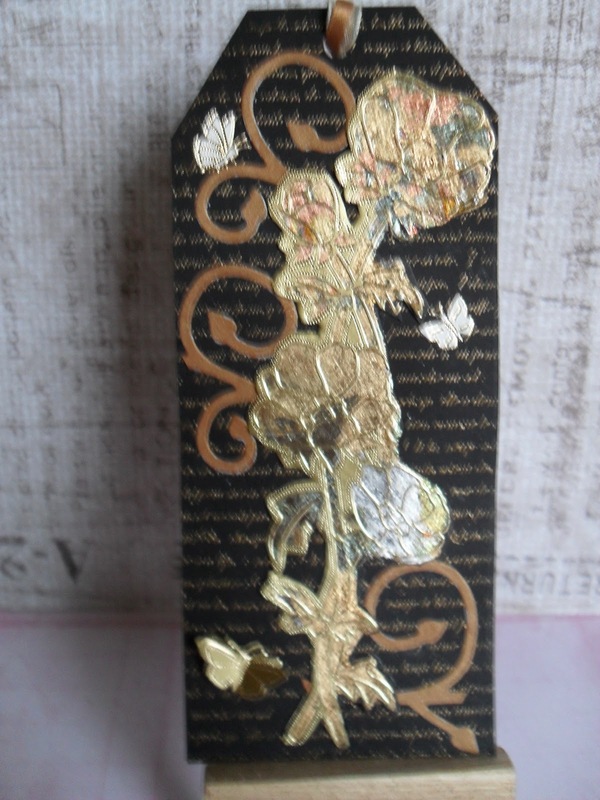 This extra long peel off of a bunch of flowers has been adorned with a mixture of gilding flakes to add beautiful shimmers of golds and silver. 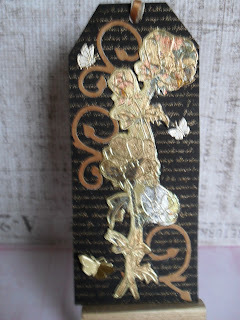 I first stamped a Creative Expressions text stamp for the background, gold embossed it to highlight on the black background. Added pieces of a die cut and some very small butterflies helped to complete. As this tag is longer than normal, I think I will give it as a bookmark gift to a very good friend. Why don't you hop over where this week we ask you to make a TAG, and to use Peel Offs. I look forward to visiting your blogs. Here we are, at Make My Monday, our first challenge in November, which should be no surprise, for we are going to be asking for challenges related to Christmas. 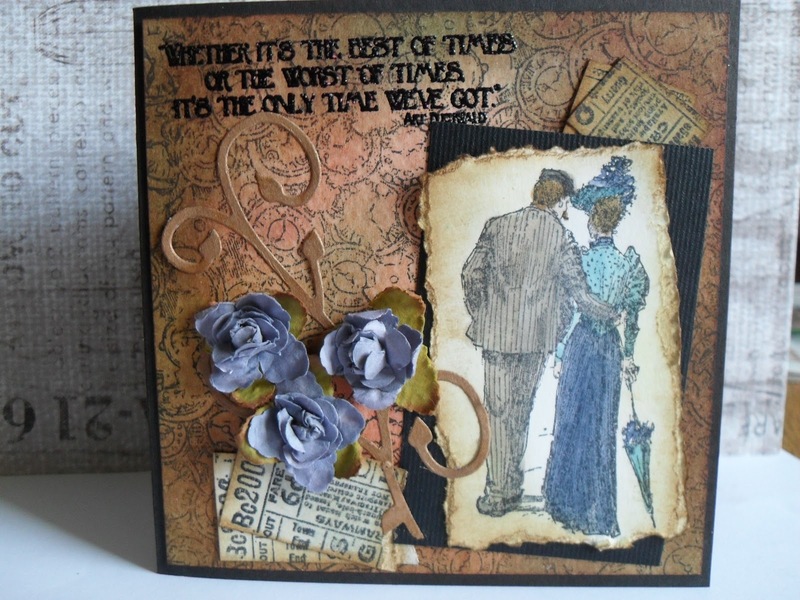 The challenges this month have been chosen by Suzi B. I would like to welcome MYNETTE, a regular participant in our challenges, who for the next month will be our Guest Designer, a regular new feature of the blog, pop over for more details. To set the snowball rolling, the first week is Vintage/Distressed. The card I decided to make is a Victorian style but with a modern twist. The backing paper is from last year or even beyond by Papermania. I stamped the image using an unusual stamp, in that it is as round as you see, no cutting involved. I coloured it with pencils, water coloured a few areas. Decoupaged the snowman and litle bog to give more dimension. I added glitter glue on lots of the snow areas, not sure if it shows but I think it will if you enlarge it. This was matted onto the same blue card as the main card, then comes the modern twist, it was layered onto a CD, you know those that keep appearing in newspapers and through your letter box - how's that for re-cycling? The stamp is from La Blanche, I get mine from QVC, though they are starting to appear on E-bay. please pop over to our blog and have a go. The remainder of the Design Team have made some fabulous cards to inspire you. Looking forward to visiting your blogs again. Don't forget about the DT call, check it out on the blog, you have until November 15th. Good luck to all who apply. For the next 2 weeks at Fashionable Stamping Challenge we are asking you to step back in time, any time, as long as it is Times Gone By. My choice of card was down to which stamp will fit the bill. Despite having a mountain of stamps, there are more of one period in time than any other, me thinks, I need, no I want more stamps. The stamp I used is from a favourite company - Inkadinkado, another E-bay purchase. I coloured it using TH Distress inks as watercolours. The tram tickets are from a stamp a friend kindly gave me. The background took the longest but I love making my own backgrounds. Again a mixture of TH Distress inks, the stamps are from the Time plate by Creative Expressions. I am late in handing in my homework to the head Fashionette so my apologies, I may not be appearing on the cat walk until later today. Please do visit our main blog, for the remainder of the design team have created some magical pieces of memorabilia. For my second Christmas card to send to St. Luke's Charity Card Challenge I decided to be traditional. I used some Christmas colours backing sheet from my stash, a dark green card, stamped and embossed the holly onto white card, matted onto some old gold card. I edged the torn edges with a touch of Fired Brick red, used several green colours to add shading and colour to the holly. The holly stamp is from Inkadinkado, I love their wooden stamps. 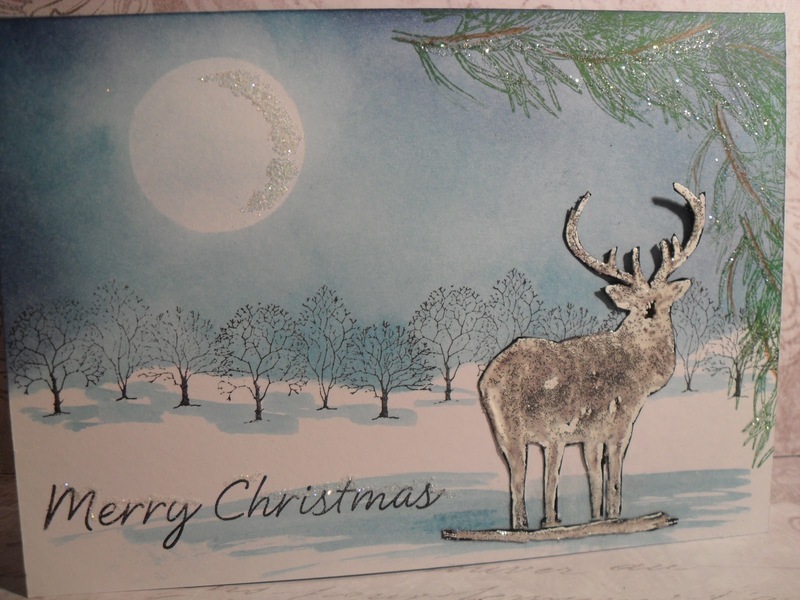 I must remember to send my cards earlier than normal this month, they need them for their Christmas Fayre on November 27th. Every card they receive can make a difference. 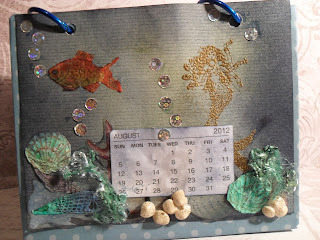 It is week 8 at the Craft Barn Calendar Challenge, so the month is August. The challenge is a deep/dark colour with circles/dots. Believe it or not it has taken me from last Saturday till today to think of a colour and a theme. The reason being I would normally for August, do a sunny seaside scene or sunny colours, a challenge indeed this has been for me. Moving my mind from summer, I then thought dark blue - underwater, will still look okay in the summer. Eventually I got the idea! A selection of dark greens and blue TH Distress Inks to colour the background. A stamped and gold embossed mermaid, a cut out gold fish, several stickies for the sea bed, plus some stamped shells and some small real shells from a charity shop shell necklace bought at least ten year ago for embellishments in my Mermaid' Grotto please pop over to say hello to Miranda, she always welcomes visitors. Oh, yes the dots and circles, punch out circles of holographic paper for bubbles. Odd bits of cut up wool for foilage. Can't wait to see what the challenge is for next week. The Make My Monday team are looking for two more members to join them. Jacqueline, the owner has added all of the details on the blog, please click on the logo on the right side bar for the details. I have been fortunate to have been a member since the blog began, regulars may like to know none of us are leaving, we aren't being replaced, no, Jacqueline is looking to expand. I wish everyone luck who decides to enter the DT Call, we are all excited knowing shortly another two talented ladies will be joining our happy group. Good luck. 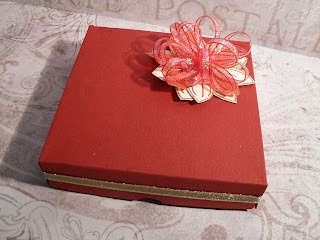 This week at Try It On Tuesdays it is a CARD WEEK, but the challenge this week is an unusual shaped card, anything except a normal square or rectangle card. Please pop over for the team have made some really interesting and different style cards. 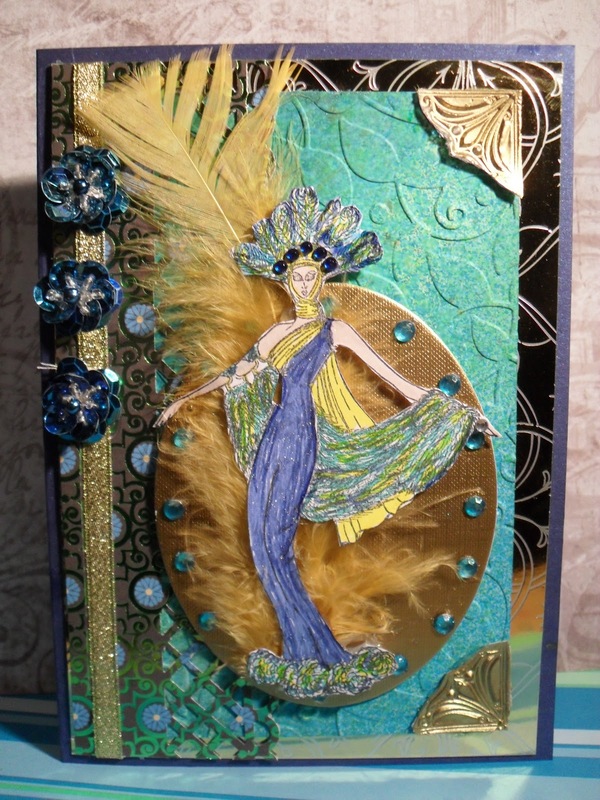 For my sample I turned to a reliable source of unusual cards - Anna Marie Designs - Templates Vol 1 (only one I have). 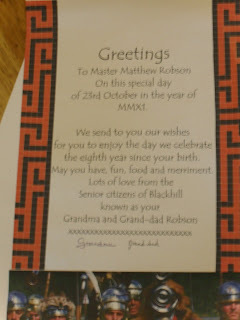 I have found my younger grandchildren have had lots of fun receiving these animal /bird shaped cards. I used a stamp to provide a branch and the leaves are stamped too. Everything else has been made by cutting card according to the template. I find this form of card sculpting very relaxing. The google eyes have been adhered with silicone, they aren't going anywhere. I hope you like Olly the Owl. Do you think he looks cross-eyed. I look forward to visiting your blogs again. Have fun and go for it. St. Luke's - It's Christmas! Here we go, Halloween is over. The first Christmas card challenge I have entered this time of the year, will probably be one of many to come. The first is an unusual size for me A6, but I have lots of envelopes this size so must get them used. I used navy card, silver holgram for matting and white card. the punched strip is with an X-cut punch, I know I used a peel off for the greeting, hands up I admit it, for quick cards I do. The Christmas stocking is one of my many favourite Christmas stamps, it is from a set by Debbie Moore. 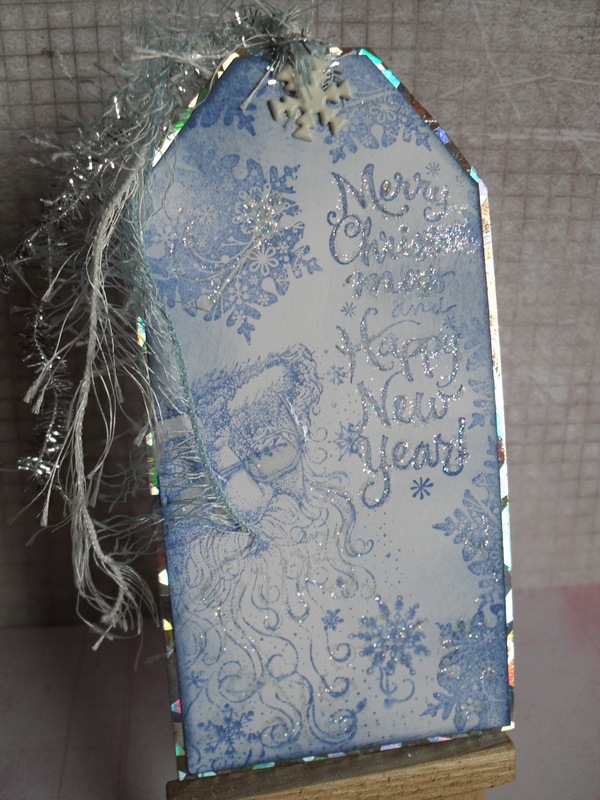 I stamped it in Versamark and used ultra fine white embossing powder. I decoupaged the bow to give a little more dimension. I am entering this card into the St. Luke's Charity Card Challenge, I appeal to those who don't know about it to pop over, check them out, they will be having their Christmas Fayre at the end of November so any donations before then would be greatly acceptable. Your cards could make a big difference to their final total. ﻿This week brings us to the end of my choices for the monthly theme of Autumn at Make My Monday I have chosen Leaves, anything you like as long as it has Autumn Leaves as a main image. 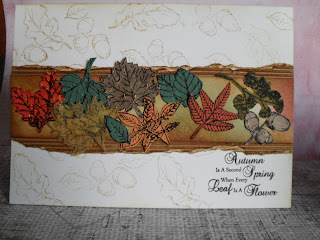 Please pop over to the blog, the remainder of the design team have created some wonderful samples with leaves. For my card I first stamped the sentiment, followed by a selection of leaves and an acorn with second generation Vintage Photo Distress ink to give a more subdued background. 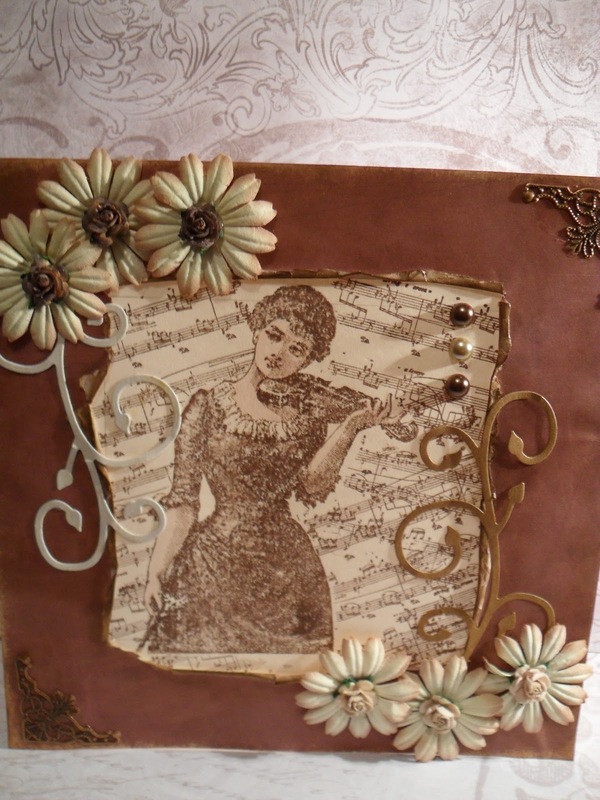 I then added a torn piece of corrugated card, to give a textured effect, edged with Vintage Photo. I then added an assortment of autumnal colours to a piece of white card, edged with Vintage Photo. The coloured card was attached with silicone to attach to the grooves. Onto the card I secured leaves which I had stamped out, using Distress Ink Black Soot, onto coloured Handmade Paper, this again provided various textures to the leaves. There were some fabulous cards entered into the challenge last week, sadly a few had missed the rule of only being able to enter into a total of 5 plus ours. I again look forward to visiting you to see your creations with Autumn Leaves. Leaves used on panel, sorry unknown, an un-named gift. Variety of TH Distress Inks. 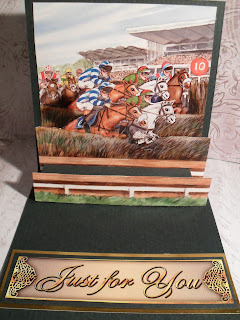 I feel I'm on a race of time, this is my fourth card for the monthly St. Luke's Charity Card Challenge, I only have a few hours left to add another card for Let's Hear It For The Boys. 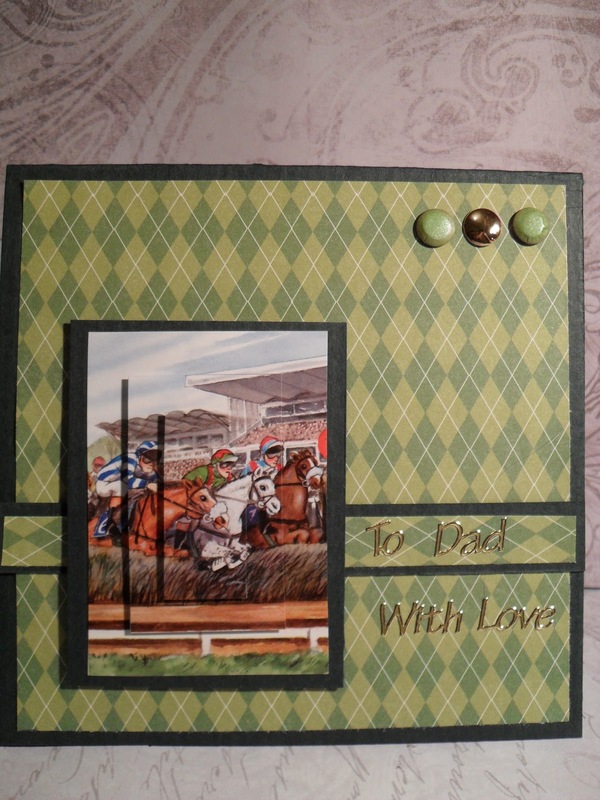 Yesterday , I bought several Trinitage sheets to make a number of men's cards also for my next class, a little something different. Not everyone enjoys stamping every week. I'll probably be popping a few more over the next few weeks onto my blog. They are pop - up cards, which you can make as simple or more embellished , it's your choice. I purchased them from Imag-e-nation which is fairly local to me, however they are available from their website at http://www.imag-e-nation.com/ look for La Pashe designs . 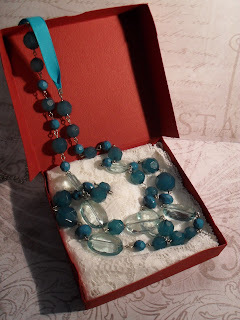 It is now the seventh week of the Calendar Challenge over at The Craft Barn, this week I have found so much easier than last week's, for finding turquoise was very difficult. Yet, Lilac and/or Purple with /without some Dry Embossing has been more fun. Thanks ladies for an easy week. 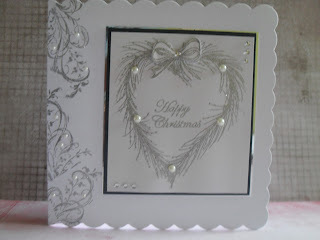 I used an Embossing folder on a piece of cream card. Used a brush to apply Dusty Concord TH Distress Ink over the card. Added a few purple jewels in the flowers. 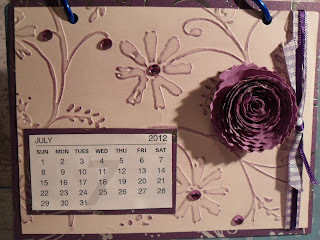 Added my calendar onto a piece of Crafty Cards paper, the same paper which the main image is matted onto. 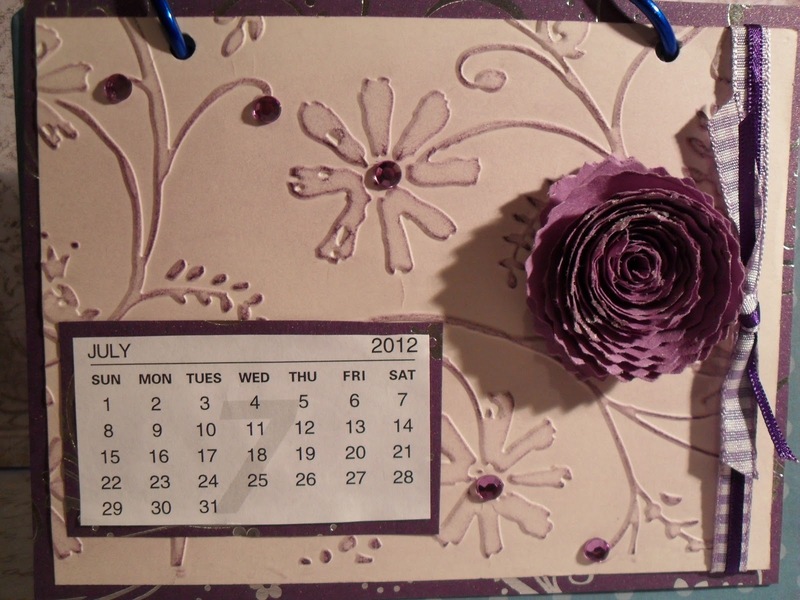 I added a home made flower, the instructions can be found for Spiral Roses on my tutorial blog. Finally added some lilac gingham and plain purple ribbon. 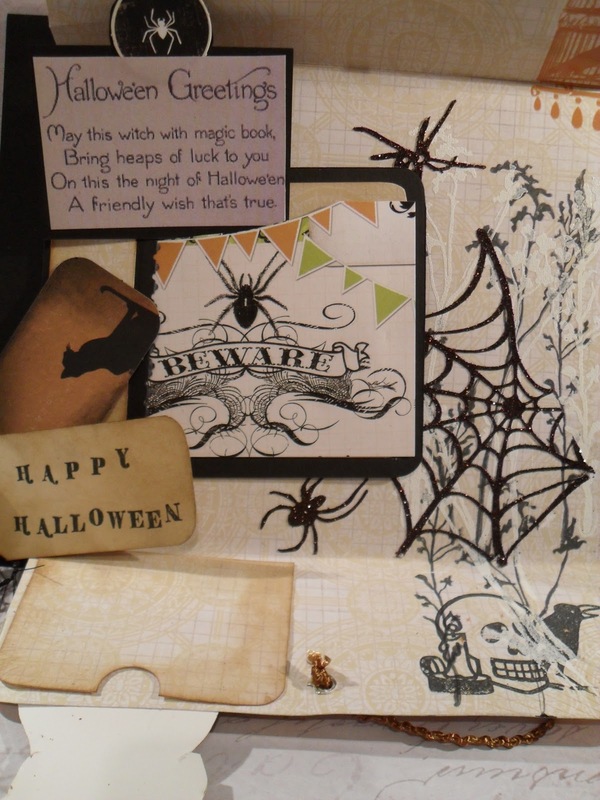 The third page of my Halloween Book, again uses Hocus Pocus papers. The skull's crown is decorated with gold glitter and small gems. Opening the card, lifting up and down the flaps, shows the decorated inside, I don't normally use stickers but these black glitter stickers were a must have for my book. 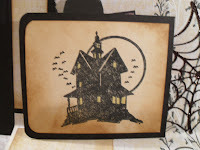 The Halloween greetings are another download, not sure if from Brenda Brown at Bumblbees and Butterflies, for she has kindly offered so many free Halloween downloads. The small tags fit into the pocket behind the Skull's head. 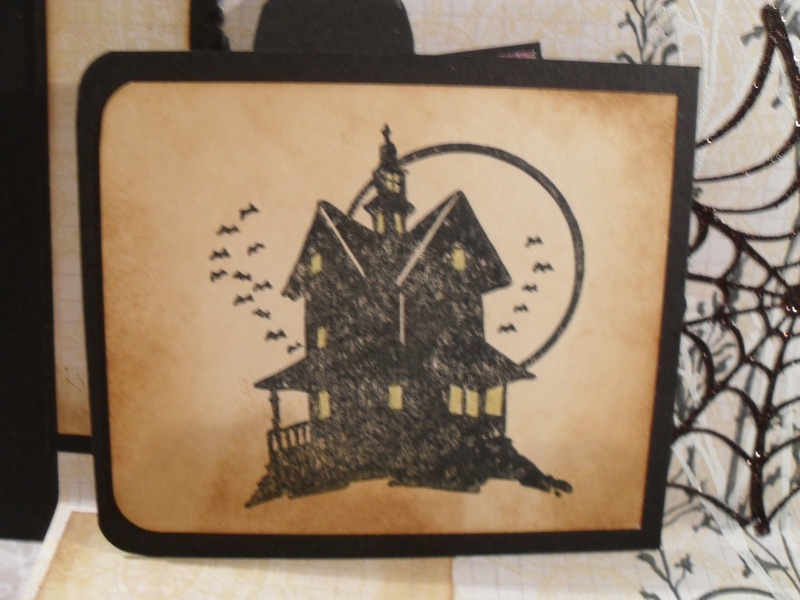 The haunted house is on the reverse of the Beware tag. Papers used Hocus Pocus - design sheets, black glitter sickers from Hocus Pocus, Stamps from Tandastamps. Black and Cream card. Time for a reminder and an up-date, how are we doing ladies? This is the list of who sends to who, I've added who I know has sent and or received. Can you please let me know of up-dates. Thanks to all. My first page is a Tag Holder with a tag. The front. ﻿The back of the tag holder and tag. My thanks go to Brenda Brown .here for her free downloads. 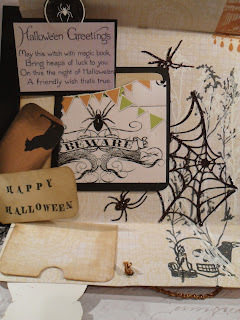 I used Hocus Pocus Papers, Black and Cream card, Tandastamps. Orange and Black - Your Choice! 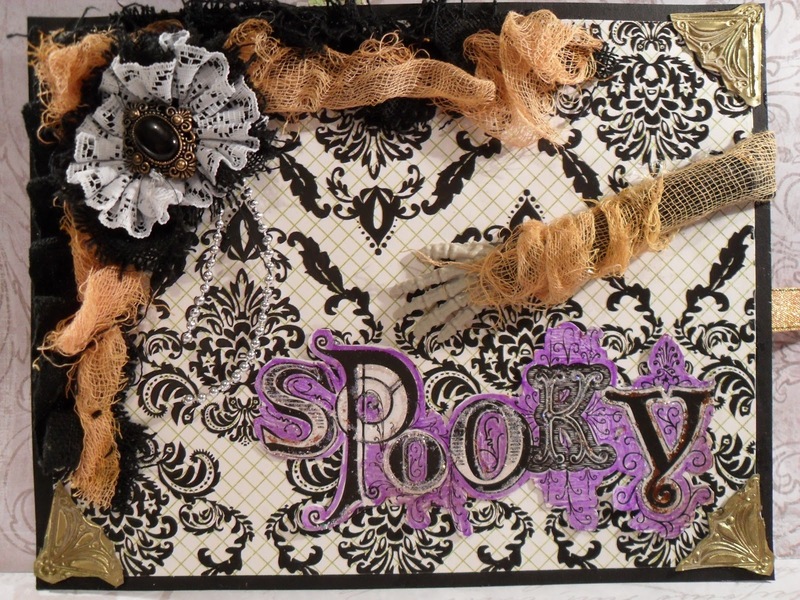 This week at Make My Monday our challenge to you is enter a project which is Orange and Black, it need not be a Halloween card, it can be anything you like, as long as it has the colours of our choice. ﻿I think this card looks more red, but honest it is mainly orange and black. 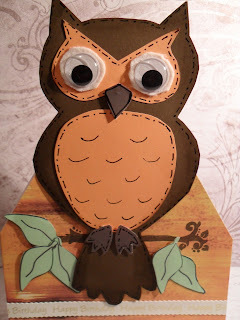 I need to make a number of such cards for my younger grandsons and of course the more creepy the better for the boys. I enjoy making shutter cards, they are really simple to make, it's the time consuming of measuring for all the sections that's a drag. I know every time I make one I say I must make a template. There are lots of samples of how to make on U tube if your interested. the plastic skeleton is from a pack of 4 from £ -land. All the stamps I used are from Tandastamps. I am looking forward to visiting your blogs to see what you have made for the theme. I greatly enjoyed the inchies cards last week, many fabulous creations, it is always a difficult choice to choose the Top 3. Well done to everyone. Fashionable Stamping- Coffee, Cream and Dark Chocolate. Starting today, for two weeks the stamping challenge over at Fashionable Stamping - definetly no digis, we are asking to see your take on a favourite type of drink, Coffee and Cream even with a hint of Dark Chocolate. Please pop over to the blog, for the description, by our wonderful leader Shirley, is a delicious use of lip smacking words where you can almost feel a warm liquid passing your lips. The samples by the DT are once again a delight to see. For my flavour of Coffee, Cream and a Hint of Dark Chocolate I started with an 8" square card. I stamped the lady musician first, masked her, stamped the backgound music sheets, making sure it was in the centre of the card. I used Memento Rich Cocoa, even the ink fits the theme. In my stash I found an 8" sq. piece of dark chocolate brown, which I carefully tore out the centre section to expose the stamped images. I distressed and inked all the edges of the brown paper, adhered it to the main card. Secured two swirls, one coffee, one cream cut with a Marianne die, added flowers in opposite corners, with smaller flowers in the centre. I further added in opposite corners a pair of filigree metal corners. The final touch being the large gemstones onto a music sheet. Music stamps La Blanche from QVC. Part Two - Inside Front Cover - I used Hocus Pocus paper to decorate the inside of the front cover. 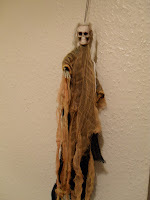 I first secured and tidied the muslin of the arm, added a long strip of orange glitz ribbon to eventually tie the book. The chosen paper was scored around the sides and bottom to provide a pocket, within which is a large tag, with a Halloween title on a pumpkin, this can just be spotted on the front of the cover. 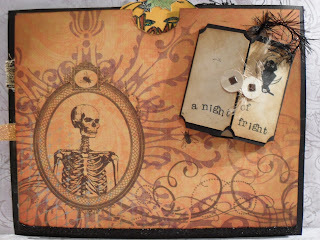 A small triptych booklet has been added with "a night of fright" stamped with individual alphabet letters, tied together with a piece of twine around two punched circles in position with brads. Close up of the tags from the secret pocket and inside the triptych. Page 1 will be added tomorrow - Saturday, thanks for visiting. Click on Halloween Book in Labels to see previous Front Cover. Some time ago I spent more hours than I intended, on U-tube, looking at all of the marvellous, Halloween books which are so amazing and full of detail, most, I believe, made by American ladies.﻿ Halloween, for we in the UK has not been such a celebrated event in the past, though in the craft world, we seem to pick up what is going on over the pond, eventually. I have always loved Halloween, even in the pathetic way we used to recognise it. I only wish now we had celebrated it as actively when I was a young girl or even when my boys were young enough to enjoy it. This is probably why I so much wanted to make a Halloween book, for no one in particular, none of my grandchildren, this book is for ME! I am hoping I will get some photos of my grandchildren over the coming years to add to the pages and tags. I have managed to complete a number of pages but I am nowhere near where I want to be. I'll probably get it finished for next Halloween. The Front Cover above, measures 9" x 7", so it's not small. 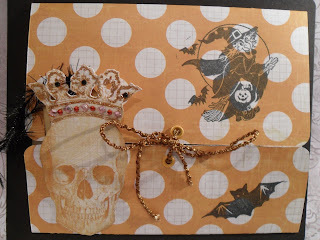 I covered several sheets of cereal packets with some fabulous papers Damask Black paper. At the local £1 shop I bought the hanging skeleton (see pic below) I could cut off his arm, glued it to the front of the book, then attached some of the black and orange muslin to the cover, added a circle of lace, added a button. 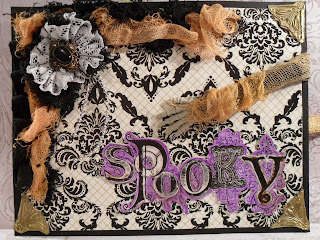 The Spooky title is cut from a sheet of Hocus Pocus paper. I ordered a fair bundle of 12 x 12 designer papers from Craft Emporium who are based on the Isle Of Man, I would like to congratulate them on their fantastic and expediant service. I made some fancy corners with the Metal magic from Debbie Moore. I hope by now your wanting to see inside. The £1 Skeleton ( actually it's only a skull and two arms, covered in muslin) - is perfect. I'll show you and tell all about the inside of the Front Cover tomorrow.